Why run an auction fundraiser? Auctions are a great way to engage and be interactive with the current donor and potential future donor population. 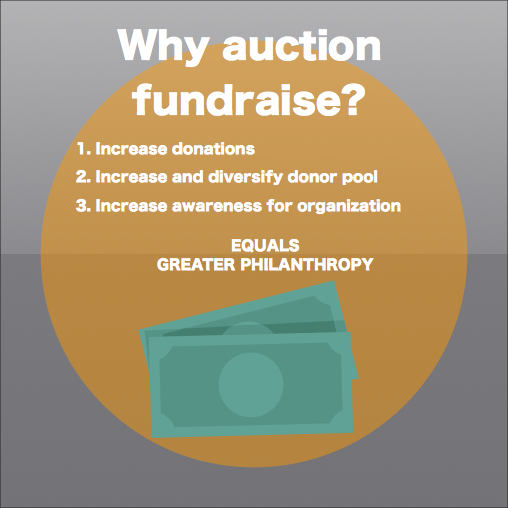 The purpose of the auction itself is to offer goods, services and opportunities that are bid-up by donors. This has a 3-fold purpose: increase donations, increase donor pool, increase awareness in the cause. Donations are increased due the auction activity itself from bidders plus the donors of the goods and services for auction items. Auctions lend to sharing and caring. Bidders are energized by the auction offerings and share the auction news with friends and family increasing the breadth of potential bidders i.e. donors. This type of organic compassion widens the audience of the mission and vision for the charity or group. Items donated at auction cost zero in terms of financial outlay. Companies large and small have marketing budgets and community support and philanthropy budgets to help many types of groups. Donations to local causes are a win-win. The organization receiving the donations turn this into dollars. Corporate goodwill is earned by businesses donating and participating in charitable giving. Be creative and ask locally for priceless donations. Guest of honor opportunity: seating, grand marshall of an event, front row or reserved parking to a special location or event (think graduation, theatre, gala), meet/ dine/ greet benefit celebrities’ such as the principal at a school, fire or police chief, a researcher fighting diseases, one-of-a-kind offerings that are local and perceived unique in value. Auctions provide lots of levels of giving from very small, to very large depending on the framework of the auction. Auction events can be VERY INclusive engaging stakeholders emotionally by offering unique or one-of-a-kind items that are of emotional or sentimental value. Many individuals only financially support when receiving something (of value) in return. Auctions are the perfect pairing for these types of supporters. Auctions capture a different unique and uncommon audiences. Add an auction to a current event to increase awareness and fundraising. Publicizing the auction publicizes and raises awareness the cause. Leverage the local awareness of brands for your cause. Promote the names of local donors to garner interest and me-too momentum. Almost all professional sports teams donate to fundraising auctions. Many restaurants (national & local) donate, goods & services that are recognizable to draw in the potential supporter building your donor base. Auctions can be done to support a critical or acute need quickly if need be. Creative auctions can gain news coverage and increase awareness of cause.